Tuberculosis-free herds proudly displayed the now century-old plaque. 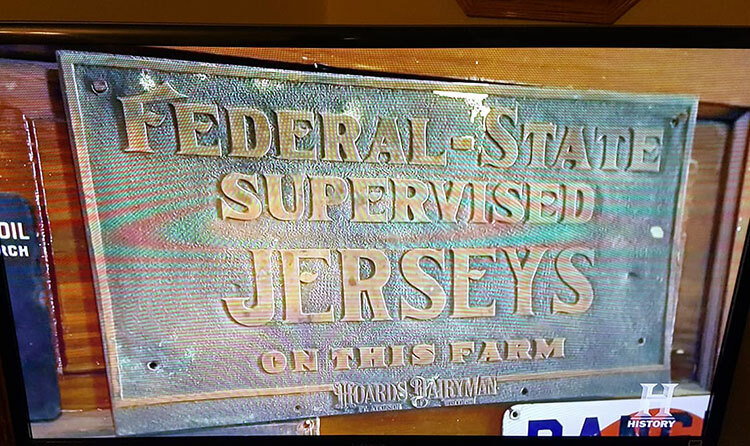 The Hoard’s Dairyman Facebook page received an inquiry about the sign below. Perhaps, you’ve seen it before. Judging by its condition, you can tell this signage has seen some years. This one depicts the Jersey breed, but we’ve seen other options with all five breeds that were recognized at the time. But, what were they for? To fully understand their purpose, we have to return to a century ago to dairying in 1917. At that time the United States Department of Agriculture’s National Bovine Tuberculosis (TB) Eradication Program had begun. The Hoard’s Dairyman staff took a hard editorial stance on the value of testing and removal of infected cattle. At that time, five percent of cattle were infected with TB. Due to aggressive protocols, that number has fallen to .0019 percent in dairy cattle in recent years. As a means to promote TB testing, Hoard’s Dairyman created the 19 inch by 10 inch copper signs and customized them for each breed. The magazine manufactured the plates in their plating division, located in the basement, (alongside the printing presses) and sold the signs to dairy farmers. They would be placed on facilities that had successfully been tested free of tuberculosis. Thanks to Deb Lakey, a Wisconsin Guernsey breeder who asked about the item, we now have information about this 100-year old dairy artifact.